Red Hot Summer will head to the Hunter Valley in 2016. Just 24 hours after Lady Gaga received a Golden Globe nomination for her first ever acting role in "American Horror Story Hotel,” the star was honored today at Billboard's Women in Music event as the Woman of the Year. 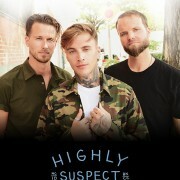 US rock act Highly Suspect play dates in Australia for the first time in 2016 at a time they could be showcasing for America at SXSW. The Hollywood Reporter released an interview with Barbra Streisand. The iconic performer (and Sherry Lansing Leadership Award honoree at THR's annual Women in Entertainment event this morning) reveals how 'Yentl' turned her into an activist, why she admires Taylor Swift and how far Hilary has come: "At first she was a bit stiff." On the 1st December 2015 an incredible thing happened. A school block was opened in Malawi that will educate two hundred children. 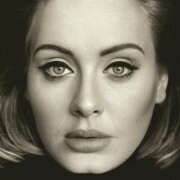 Britain's Duchess of Cambridge has reportedly organised for Adele to give an intimate performance at her birthday party. 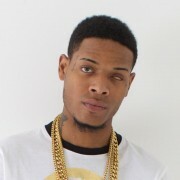 Rap star Fetty Wap is reportedly set to become a dad. The Official Top 20 Frank Sinatra songs were announced today, Sunday 13th December, as part of BBC Radio 2’s Sinatra season. Chris Martin and Gwyneth Paltrow seem to have managed Hollywood's friendliest breakup, as they reportedly grow even closer. The Osmonds defied Led Zeppelin's manager and the "rock press" when they duetted on stage. Ellie Goulding's friends are reportedly reassuring her that splitting with Dougie Poynter is the right thing to do. Prince has surprised fans globally with the unexpected release of a new 12-song album, HITNRUN PHASE TWO. Rihanna’s grandmother would be delighted to know her legacy is helping others. Nicki Minaj is reportedly planning an imminent wedding to Meek Mill. 200 years ago, if people could have travelled like they do today Beethoven would have gone on a world tour. Imagine hearing ‘Fifth Symphony’ or ‘Moonlight Sonata’ live by the man who wrote them? 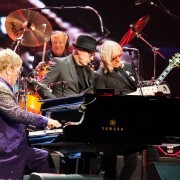 That is what being at an Elton John show is like. Amazon.co.uk has revealed its ‘Best of 2015’ album list, with The Magic Whip by Blur taking pride of place at #1. Muse have reportedly signed a deal to join the Foo Fighters and Coldplay on stage at the five-day festival in Somerset, England, in 2016. 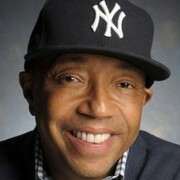 Hip-hop mogul and entrepreneur Russell Simmons wrote an open letter to his former friend Donald Trump because he felt the need to call the billionaire presidential campaigner out on his insincere platform. Birmingham rock legend Tony Iommi will take to the stage at Town Hall, Birmingham on March 19 for a unique event that will see him reviewing his life and career at the forefront of one of the biggest bands in rock music history. Ozzy Osbourne turned the tables on a home invader who attempted to burgle his home by attacking him while naked. Country superstar Dolly Parton is putting together a special time capsule to be opened on her 100th birthday. 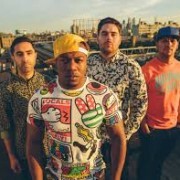 The winners of the BBC Music Awards 2015 have been revealed tonight as part of a star-studded show from the Genting Arena, Birmingham. Jammed with breathtaking performances from some of the biggest names in the international music scene, five awards were given out on the night. Ross Hannaford is feeling better today after having to postpone last night’s ‘Hanna’ album launch and the show has been rescheduled for next Tuesday (15 Dec 15). Cyndi Lauper has covered Dolly Parton’s ‘Hard Candy Christmas’ as a Christmas treat for fans.